Blue Moon of Kentucky shining from My Blue Heaven. Bluebirds Over the White Cliffs of Dover and Blue Bayou. Blue Skies, Blue Bossa. Blue in Green, Blue on Blue. Pink Turns to Blue and Crystal Blue Persuasion. Blue Velvet on a Blue Christmas. Blue Monk, Blue Trane, Blue Rondo a la Turk. Why so blue? The song is you. There is so much more blue than green in life. So much more losing than winning. Blue is sorrow, lament, regret. Blue is also camaraderie in sorrow, lament and regret, and the optimism of dawn. It’s always darkest before the dawn. Blue is the narrative thread of Old Blue Eyes. 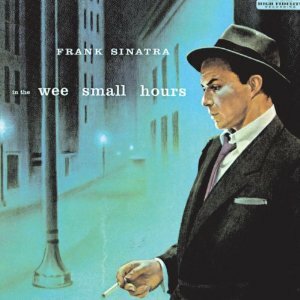 Sinatra’s In the Wee Small Hours may be the most perfect nod to blue noir in the zeitgeist. The cover is a striking blue. Track two, after the title, is Ellington’s “Mood Indigo.” Then “Glad to Be Unhappy,” “I Get Along Without You Very Well,” “Last Night When We Were Young,” and “I’ll Never Be the Same.” The mood is black and blue; a guy down and out and feeling blue about it. Melancholy blue. If ever a record were a color, In the Wee Small Hours is blue. 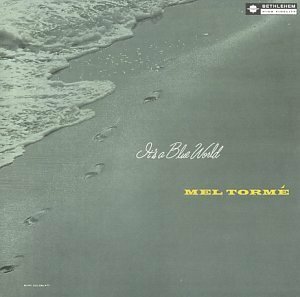 Same year, 1955, Mel Torme captured the light blue. Where In the Wee Small Hours is the darkest blue, It’s a Blue World is buoyant blue. The record is lush: large strings, major tonalities and, front and center, the pipes of the man known as The Velvet Fog. The opening track is “I’ve Got It Bad (And That Ain’t Good),” but Mel sounds like he doesn’t have his heart in these blues. Too much joie de vivre. Later tracks include “Polka Dots and Moonbeams” and “I Found a Million Dollar Baby (In a Five and Ten Cent Store),” further lightening the shade of blue of this world. But both albums are blue, and so are we. Let’s put them on the hi-fi. Set up a round, and maybe another. Talk to me. Tell me about the one that was and the one that got away. Let’s embrace the blue. Let’s stay up until the wee small hours and swap stories about our blue worlds. Without the blue, we would be without a song. Beautiful again…it kind of leaves me with the hint of a memory, but I can’t fully place it. Wow. Hobbler, that’s mindblowing. I hope it’s a great memory that carries your day. I appreciate all the rich blue here. It feels melancholy. …reminds me of Mad Men, a very blue time in our history. Yep; amazing period. Both albums are very near and dear, and naturally I have both on original vinyl (thanks, Ma!). Take a listen and enjoy! Thanks so much, Mimo! Great to have you here. Nicely done. It is interesting that blue is the color most often sung about or used in lyrics. It’s a color with so many variations and it has so much depth. Yes! I really started noticing that as I was writing this one. Many shades and nuances, just like life. Frank and Hank in the same comment! Winning! Sir, you are really bringing your best work to us, your readers, right now. I am thrilled to be here, watching you remove language’s pin tucks, leaving the fabric of the idea loose, but still cohesive. Nicely done, mister. Very, very nicely done! Reminds me of Sky’s song in “Guys and Dolls” – “My Time of Day” “my time of day is the night time, a couple of hours before dawn . . .” one of the loveliest songs ever written, blue and hopeful all at once. Awesome! I hate musicals, but I love blue and hopeful! Cheerfully rephrased: I love musical soundtracks. 😉 Yes, Rodgers/Hart wrote some A-List stuff, for sure. In league with Harold Arlen and of course the Gershwin/Porter school. Yes! Love, love, love Arlen. Only you can get everyone contemplating Blue. Love you and your blog which is why I nominated you for a Sunshine Award. Congrats! Go to my blog to read up on it. Elvie, you are way too sweet, thank you! I’m actually not doing peer awards anymore, now that WordPress is blocked at the day job and I have even less time to write, but I’m blown away and grateful beyond words for you to think of me. Thank you so much! Well you deserve it and work always gets in the way fo fun! I look forward to reading your blogs. And don’t work too hard! AlRIGHT! Way to take a stand for winning! Pingback: 5-Minute Dance Party [Fascinating Rhythm] « Bluebird Blvd.